A very big THANK YOU to Llanelli Library (especially Tracey, Giovanna and Tania) for inviting me to help celebrate World Book Day with them. Miss Owen’s lovely Year 1 class from Bigyn School came along to listen to my stories and take part in a making Welsh cakes role-play. It was great fun. Well done everyone! Waiting for everyone to arrive for story time! A very big DIOLCH YN FAWR to everyone who came along to WHSmith at Parc Trostre, Llanelli for a Welsh cake and a chat. And thank you to everyone who bought copies of my books – I hope you enjoy the stories! Diolch yn fawr iawn again to Terry and his team for always making me very welcome. Hope to see you all soon! I had a lovely afternoon at WHSmith in Parc Trostre Llanelli today, and met lots of wonderful people. Thank you to everyone who came along and bought books for me to sign, and thanks once again to the manager, Terry, and to his team at the shop. And a very big “THANK YOU!” goes to Megan and her mum for taking and letting me use this photo. 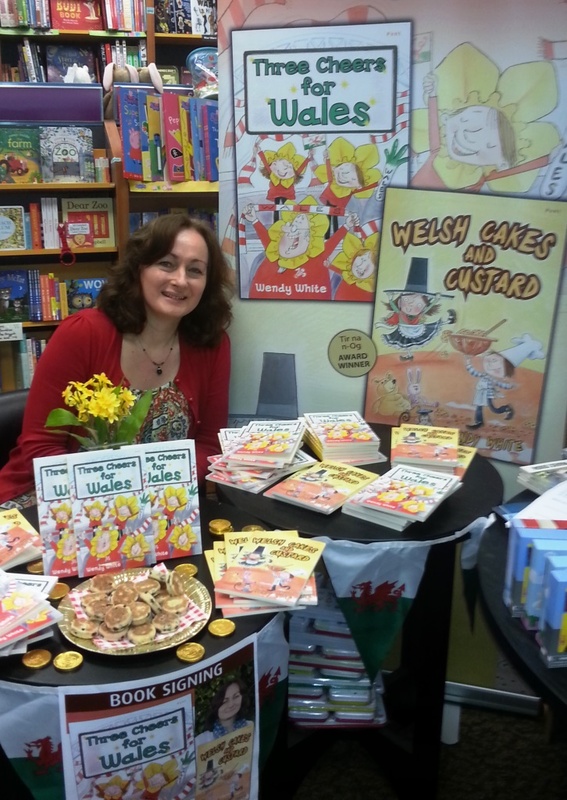 It was lovely to meet you both, and I hope you enjoy your copy of ‘Welsh Cakes and Custard’, Megan. Diolch yn fawr iawn!! !